Mummy put us out in the garden for a couple of hours on Friday, me with Midge and Percy with Oscar. She’s been giving us some grass from the garden for ages, so we shouldn’t get upset tummies from the change of diet. And we were only outside for a couple of hours, anyway. But now I’m going to hand you over to Percy, your new correspondent. Hello. I’m Percy. Thank you for voting for me. Kevin says I just have to tell you what we’ve been doing. We went outside on the grass on Friday. It was a little scary. I hadn’t been on the grass before. Mummy put me down in a run with Oscar. We grumbled at each other a bit. 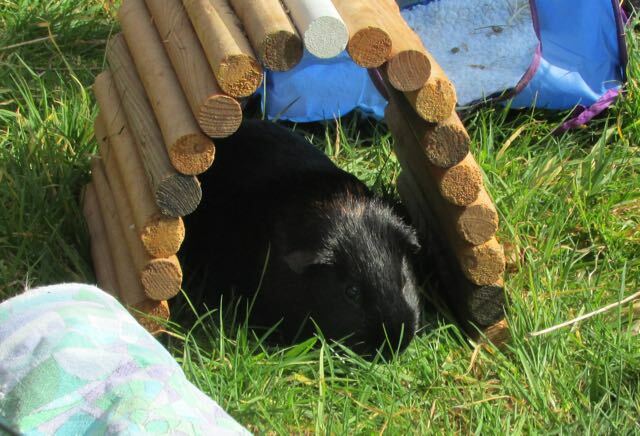 I wanted to eat grass and hide from the huge sky above us. Oscar wanted to rumble at everybody. He tried to pull the fence down too. I got on with eating. I don’t know what Oscar did. I think he ended up eating too. I said hello to Kevin. I had only seen Kevin in passing before. He’s nice. I would say that even if he wasn’t reading this. He’s showing me where to put my feet to make it work. It’s very complicated. Here’s Kevin. Kevin here. That was very good, Percy, you’ll soon get the hang of it. Mummy gave me a special message for Roland. Mummy says she’s taken a photo of the message in your card from last year, as she planted the card in the wildflower garden. Apparently the card had seeds embedded in it. Anyway, she’s kept your request to be a ninjineer and she’s thinking about it. And she’s marked where she’s planted the card so she can take photos of it grows. Look, I don’t know what it means either. I’m just passing on the message. I hope we can go out in the garden again this week. I hope your porch will be okay, Julie. I thought a tree had blown down in the night, but I can’t find anything that might have made the noise that woke me up. Happy Eater to you boys, too! 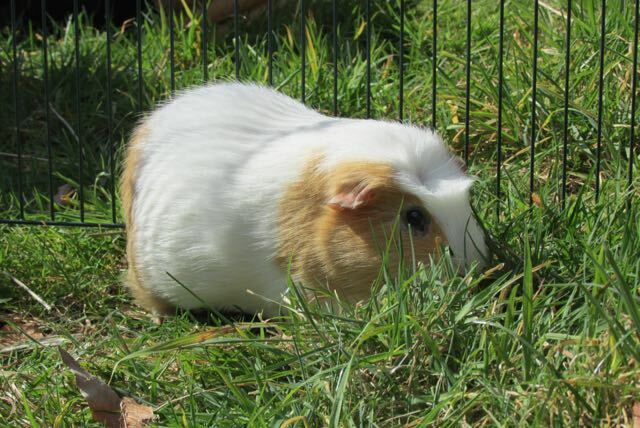 I am sure the grass was delicious, and Percy, that sky can be intimidating the first time, but you’ll get to like the warm sun! Atticus and Roland told me to get one of those cards for Mummy; they know how much she likes them. I’ll pass on the message! Roland wants to be in the tradition of big brother Willoughby the ninja and Uncle George the engineer. He’s certainly a scamp like Will, and I think he can mature into the role of engineer. I’m glad y’all got to spend the day outside – it’s been raining a lot here and when it is sunny its too windy!! Hope you had a nice Easter!